Becoming part of the MBH’tale only takes a few simple steps as described below. But if technology starts to deplete your superpowers know that you can make it as simple as just dropping on into a class you want to try and we’ll do it all for you in house or even over the phone. Nope, we won’t let anything stop you from working your magic. Start with Creating An Account – click here. Create your wonderfilled-self an account on our MindBody booking software and you’ll be on your way to loving your life forever after! All you’ll need to do is create yourself a login with your email address and a password (that you can remember) then complete your account by filling out the rest of your details as prompted. Once your account is created you can log in, buy sessions, book into classes, cancel classes, become a member or even just revisit us with ease us whenever you fancy. To have our world of wellness literally at your fingertips we recommend you download the FREE App onto your mobile and or tablet. It’s super user friendly and with a single click, you can create or access your account to book, buy, sign in, cancel, receive important notifications and special offers as well as keep a record of all your classes. 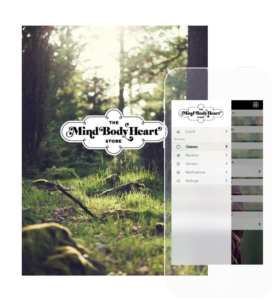 Or simply search ‘Mind Body Heart’ (don’t forget the ‘heart’) in the app store or google play. Yes, it makes our life easier but if it doesn’t do the same to yours then away with it! We’ll admit it helps us to know who’s coming to class but because our wonderland is so spacious and our instructors are so experienced, we don’t mind if you simply book in upon arrival or prefer us to do it for you before/after class. But… if you like being organised or need some accountability, scheduling your week of wellness can really help you re-write your fairytale. You can book up to 4 weeks of classes in advance and best of all, if you change your mind or your schedule you can cancel and re-book anytime. Don’t worry.. we got you. Until we build Cheshire cat-mobile, we can’t make it any easier than just asking you to show up to the class you fancy and allow us to do the rest. So whether it’s a last minute decision, a technology melt down or just a preference for the old school way, we welcome spontaneity, walk ins and last minute drop ins any day! *This is only applicable for our weekly classes. For our special events and selected courses we do need to know you’re coming so please book online or drop us a line with a text or email. It will be noted in the description if bookings are essential. They don’t exist in wonderland! Our wellness wonderland is big and beautiful which allows us the room to do away with wait lists and cancellation policies. We want you to love your life forever after and no one loves cancellation fees or being on standby. *There are of course some exceptions when it comes to our special events and selected courses. Also, we do cap our classes to ensure a magical experience but so far in the story we haven’t had to turn anyone down or charge them unnecessary fees. If you have booked into a class under your account however and need to cancel a session you can simply log into your account and cancel under ‘my schedule’. Told you it was easy..